The simple rhyme is presented in a tabbed board book. 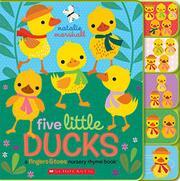 Most American little ones have early exposure to “Five Little Ducks.” Marshall breaks the ubiquitous nursery rhyme down to five turns of the (exceptionally sturdy) page in this tabbed board book. Each tab has a different number of ducks on it, descending from five to one. As fewer and fewer ducks make their way back to their mama, an inset icon shows a hand bringing thumb and forefinger together in imitation of a duck’s bill, encouraging participation when Mama Duck quacks. A similar icon in the upper left shows a hand with the appropriate number of fingers held out. Although there are similarities, these are not American Sign Language. The illustrations are eye-catching, with greens, yellows, and blues dominating the spring-color palette. The ducklings and their surroundings are cleanly presented in precise if busy layouts. Little ones who know the song will surely delight in flipping the pages and singing along; their enthusiasm will likely outlast their caregivers’.